a book chick: "Small Victories"
my take: As noted in a previous post, Anne and I are incarnations of a very similar being. So she pretty much writes what I need to read. If you are not semi-neurotic you maybe don't love Anne's worldview. 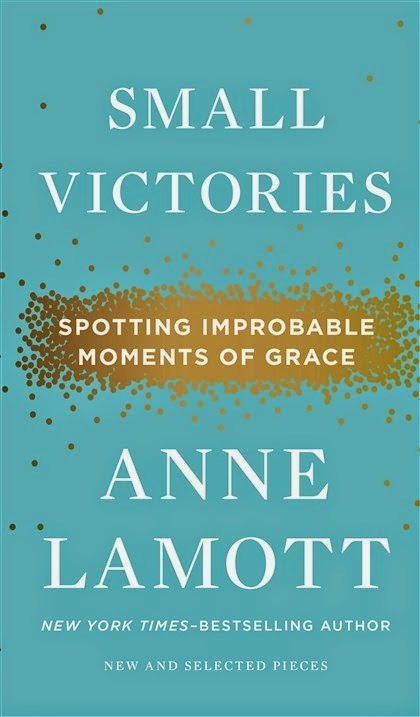 "Spotting improbable moments of grace" is really the task of each us. It's often easier to do in the rear view mirror rather than in real time. Anne sifts through her various life experiences and gleans the little pieces of gold. Which is why I think the cover has little gold dots. After seeing seals on the beach and thinking she needed to save them: "This is how I feel about the world much of the time, when I am not feeling too far gone: Things are how they are supposed to be, all evidence to the contrary. Life swims, lumbers across the sand, rests; lumbers, swims, rests." "....The crime was that below the down jacket she was wearing spandex bicycle shorts. She wears bicycle shorts nearly every day, and I will tell you why: because she can. She weighs about eighty pounds. She has gone to the gym almost everyday since her divorce, and she does not have an ounce of fat on her body. I completely hate that in a person. I consider it an act of aggression against the rest of us mothers, who forgot to start working out after we had our kids." "...God began to act like Sam-I-Am from Green Eggs and Ham. Everywhere I went there were helpful household hints on loving one's enemies, on turning the other cheek, and on how doing that makes you look in a whole new direction. There were admonitions about the self-destructiveness of not forgiving people, and reminders that this usually doesn't hurt other people so much as it hurts you...Suggestive fortune cookies, postcards, bumper stickers began to pop up here and there - everything but skywriting - yet I kept feeling that I could not, would not, forgiver her in a box, could not, would not forgive her with a fox, not on a train, not in the rain." It's a smallish book with great stories from her life and her sortings. One I could re-read to gather more insights into my own failings and for more inspiration for digging for grace.